Isn’t is sneaky how December creeps up on you like that? You think it’s so far away and then the first of December is here and you are already feeling like you have dropped the ball on finding matching family pajamas and getting photos in time for the Black Friday sales! Well, my friends – I am here to tell you that you are not alone. However, I am beginning to embrace the frantic. So, here I come December!! Away we go! As always, the holiday season means I am in my craft room creating projects from tags to cards to mini scrapbooks. Today’s project is a card along with a gift for a special someone. I created this card by starting out with the Wood Texture Paper Stack from Stampin’ Up! I am really enjoying the plaids and wooden elements in the décor aisles so I wanted to bring it into my project today. To make this background look even more textured, I went ahead and dry embossed it with the Corrugated Cardboard Embossing Folder! TIPS AND TRICKS:// Hold it here though Champ!! That Corrugated Cardboard Embossing Folder shrinks your paper so if you want your background to be 4” x 5.25” then you should have a piece of paper with an extra quarter inch around it. Always measure it before adhering it to anything. It was really fun to find myself back to distressing in such a way. I went further and distressed the edges with early espresso ink all around each layered piece. Finally, the Sprig Punch can create the perfect antlers but also the perfect wreath! I piled some layers and then stamped “Best Wishes” in the center of the stitched shape. But I couldn’t just leave that beautiful sentiment there. Using some crumb cake cardstock, I created a quick tag. 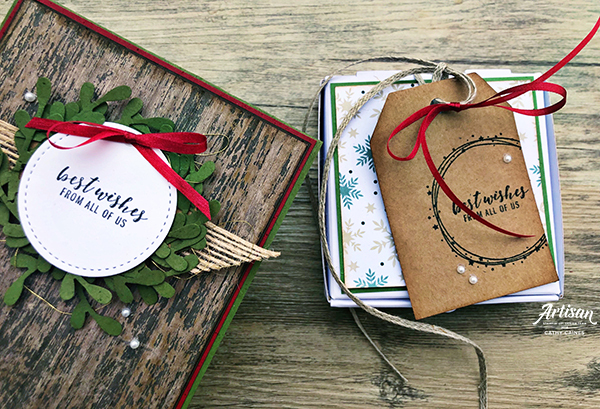 You can find the sentiment in the Itty Bitty Greetings stamp set as well as the wreath in the Making Christmas Bright stamp set both by Stampin’ Up! Don’t over think tags. Stamp. Add ribbon. The end. I promise it will be gorgeous! 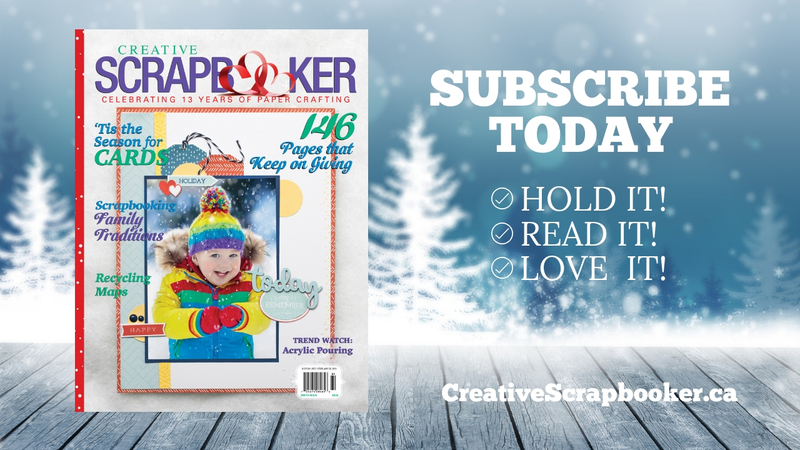 I am so excited to be taking over the Creative Scrapbooker Magazine Facebook Page on December 13th at 11 am MST! Be sure to pop by and tell me Happy Birthday! Yup, that’s right – it will be my 37th birthday and I am very happy to be celebrating with all of you! As an added bonus, hang out for a little while to create a holiday project! Until then, have an awesome week. But most of all, have an amazing Christmas and Holiday Season from my family to yours!